This year the Tonner Doll Company, ever inventive and risk-taking, decided to make a set of collector dolls based on the "Warm Bodies" zombie movie. I'm surprised! I find these dolls a bit boring, but appreciate how closely the dolls resemble the actors and characters. 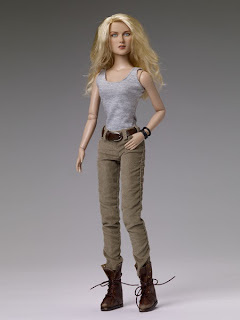 The "Julie" doll wears laced combat boots, a grey tank top and brown corduroy jeans. 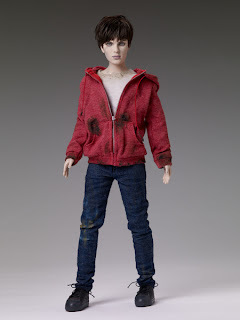 The Warm Bodies "R" doll features R wearing a red hoodie, realistic looking ripped and soiled jeans, and black shoes complete with shoe laces.